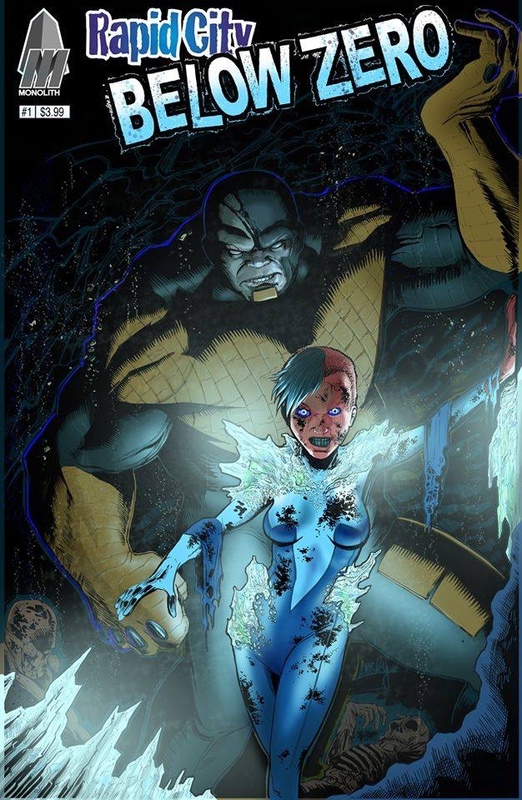 This 12 part comic book series follows Icicle, a female super-villain, on her journey to get revenge on the man who killed her lover. A gang of super-villains are betrayed and murdered by their boss, the ambitious Coil. The only survivors of this treachery are Claw Hammer and Icicle, and in among the dead is Icicle’s boyfriend Piledriver. Before she can take her revenge, Coil positions himself at the top of Rapid City’s villain underworld. She no longer knows who she can trust. What is stronger, loyalty to a friend or fear of a new crime boss? Rapid City: Below Zero #1 gives us not only a bit of an origin story, but also a back story! The origin part is pretty good – we get an initial look at Icicle and her upbringing, we also get a glimpse of how she got her powers – but not all of it, and I liked this a lot. Just enough to give you hook, but not the whole way. Then we jump to the back story which leads up to where we are now – a heist, a betrayal and vengeance promised. It all links up nicely with something to look forward to next issue and beyond, and enough gaps to uncover as well! Considering we get those three aspects, there is a lot squeezed into this issue, without making it oversized and hard to get into, so that works out well. The setup also allows us to consider spin-offs into the same universe! The art is nice, with the underground scenes being suitably claustrophobic, while the flashbacks to ‘happier days’ are lighter and bright. In all this is a nice introduction, which teases you for the series, but gives you enough to keep you interested – worth checking out!